To MP4 Converter is a free software to convert audio files to the MP4 audio format. It contains a simple interface, with complete tag editing functions, and a player that allows you to compare head to head the original versus encoded audio. 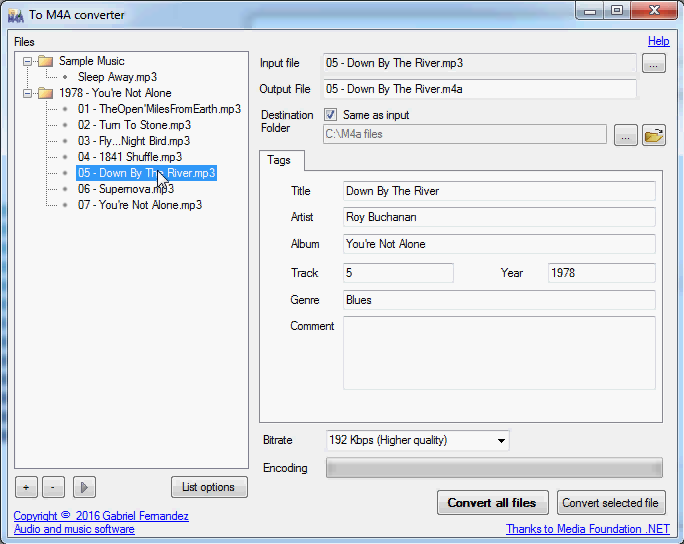 To MP4 Converter is a free and powerful software to convert audio files to the MP4 audio format.It contains a simple interface, with complete tag editing functions.Its internal player allows you to compare head to head the original versus encoded audio files, to help you choose the best compression settings for your needs.Most audio formats are supported, and multiple files can be converted at once.Recommended download. Xlinksoft Xbox Converter can convert almost all popular videos formats to Xbox and Xbox360. Play and to convert AIFF, AIF, AIFC, MP3, WMA, fast and easy! Also, AIFF Player Plus 3.0 contains the ability to edit the AIFF, AIF, AIFC, MP3, WMA audio format, so you can cut and edit your audio files, easily. AutoSitePasswords is a users admin tool for Apache web server. AutoSitePasswords keeps the users database and allows to append, edit, delete and search the users records. AutoSitePasswords makes the Apache passwords files. TunesKit Audible Converter for Mac is a unique and special DRM removal software for Audible audiobooks enables you to convert any Audible AA, AAX audiobook to DRM-free MP3, AAC, M4A, WAV, M4B, FLAC, etc with lossless quality at 100x faster speed.